We offer unparalleled professionalism in rain gutter installation and roofing services. Jeffrey Watt has been around rain gutter installation since he was five years old. He started Affordable Gutters Plus LLC in 1995, when he was only 20 years old, with one truck and one employee. Now, Affordable Gutters Plus has grown to 5 trucks and 10 employees, and continues to grow. All of Mr. Watt’s employees have been with him for a minimum of five years, with sister Kristi running the office, and brother-in-law Phil running one of the crews. 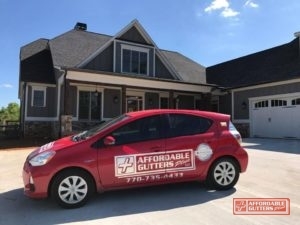 Affordable Gutters Plus LLC holds a Cherokee County Business License, Workers’ Compensation Insurance, and General Liability. They are proud members of the Better Business Bureau and the Greater Atlanta Homebuilders Association. Affordable Gutters Plus provides unparalleled service for our customers’ gutter and roofing needs.We offer comprehensive expertise for all levels of rain gutter installation and maintenance. For clients who need new gutters, we offer the highest-quality seamless rain gutters available. Our leaf guard gutters save on maintenance and increase the lifespan of gutters. Our roof drainage and general roofing services protect your home, and act as preventative maintenance against future problems. The heart and soul of our business, we install rain gutters that protect the value of your home. When it rains, you want a gutter and drainage system that siphons and expels water away from the house. We understand all the particulars of this process, and offer products that protect you every step of the way. If you ever need rain gutter installation or maintenance in Canton and Roswell, GA or the surrounding area, do not hesitate to call us at 770-735-4433. Updated on September 20, 2018 at 4:56 pm by Affordable Gutters Plus LLC.